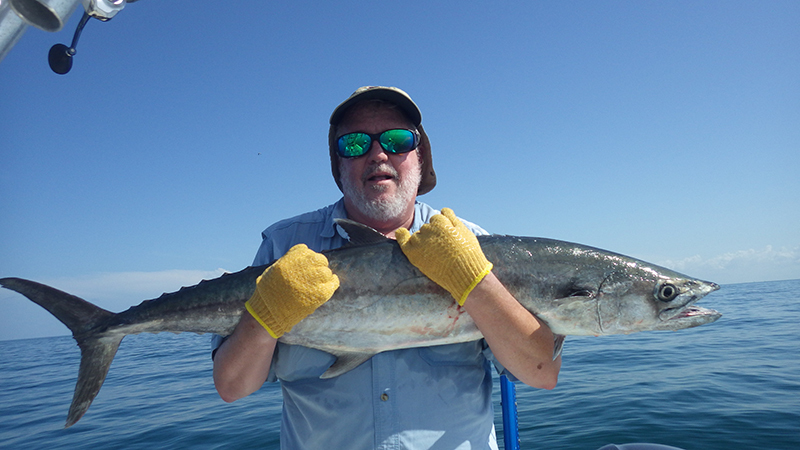 Skip Tubbs, visiting from Montana, holds onto his catch, a kingfish caught July 16 on white bait 7 miles offshore while on a charter fishing trip with Capt. Warren Girle. 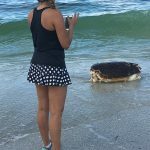 Despite being overrun with dead fish on the shore and marinelife that is overstressed by red tide, Anna Maria Island fishing can be productive. Fishing the outer boundaries of the red tide or traveling north to areas where the water is not contaminated is key to finding the bite. The highest levels of red tide this past week seemed to be from the Anna Maria Island Bridge south through Sarasota Bay and along the beaches of Anna Maria Island and Longboat Key. 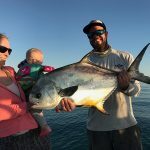 Fishing north in Tampa Bay, as well as its connecting waters — the Manatee River, Tera Ceia Bay and Miguel Bay — is productive for anglers who just have to be on the water. For visiting fishers only here for a short time, these areas are providing enough action to bend a rod in the morning and possibly enjoy a fish dinner back at the vacation home. Although this outlook is promising, remember fishing in these conditions is day to day. You might do well in an area one day, but if red tide sweeps through the next day, you may not catch a thing. Ultimately, the key to producing a bite during a red tide bloom is being flexible and willing to travel. You may end up in waters you’ve never fished as you run from the red tide, but that’s a good excuse to do a little scouting in some new waters. You never know, maybe you’ll learn something. On my excursions with Southernaire, I’m staying north of the toxic bloom by fishing Tampa Bay. Mangrove snapper action around rocks and docks is exceptional. Limits of snapper are being caught, usually within an hour of hitting your target. The key is to find the fry bait. Where this bait is present, you should find a mangrove snapper bite. I’m also finding a decent redfish bite. Due to the vast amounts of fresh water flowing out of the Manatee River, I’m starting to see many fish enter Tampa Bay. And for the sport fisher, mixed in with the reds are catch-and-release snook. Fishing deeper grass areas is yielding a plethora of spotted seatrout. Most are just short of being keepers, but if you’re persistent, limits of trout are attainable. You just might have to catch 20 or 30 to get a keeper fish. Lastly, fishing around wrecks and rock piles in depths of 10-20 feet is producing excellent action on Spanish mackerel. Chumming heavily with live shiners is key to keeping these fish in the mood. Jim Malfese at the Rod & Reel Pier says despite the red tide, fishing is good. Waves of red tide are moving in and out of the bay, so picking your times to fish is key. On days when the red tide is mild or missing, pier fishers are catching plenty of mangrove snapper. Redfish are being caught using the same bait — live shrimp. A few catch-and-release snook are being hooked using larger baits, such as pinfish. Lastly, sheepshead and black drum are being caught on shrimp at the R&R. Capt. 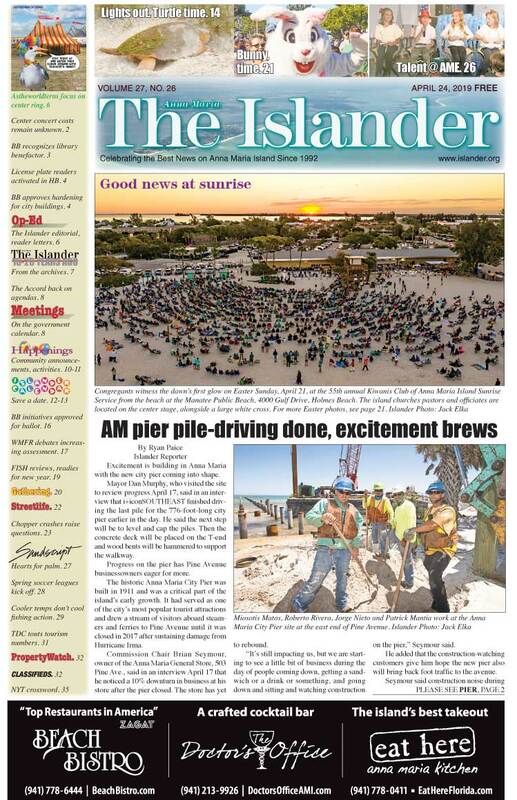 Aaron Lowman is working north of the Anna Maria Island Bridge to avoid red tide. By fishing southern Tampa Bay and its adjacent waters, Lowman is finding an abundance of spotted seatrout. These trout are being found over deep grass areas. While targeting trout, Lowman is catching numerous mangrove snapper, as well as a few mackerel. Fishing structure in Tampa Bay is yielding macks and mangrove snapper. This bite is more consistent than on the deep flats. Lastly, catch-and-release snook are showing up for sport fishers along mangrove shorelines. Capt. Warren Girle is catching fish, despite the red tide. He’s traveling beyond the red tide to offshore areas to produce action for his clients on mangrove snapper and grouper, while bottom fishing around ledges and reefs is producing mangrove snapper 14-18 inches. The same applies for the groupers, although juvenile sizes are most apparent. Also, while traveling from spot to spot, Girle is keeping an eye open for floating debris. When lucky enough to see this, Girle is putting clients on triple tail. Capt. Jason Stock also is working clear of the red tide by fishing north of the Anna Maria Island Bridge. While in Tampa Bay, Stock is finding action for clients by anchoring around structure for mangrove snapper and Spanish mackerel. Both are being caught on small live shiners. Blacktip sharks are present in Tampa Bay, which is good action for those who want to hook up something big. Moving offshore, Stock is running into the Gulf of Mexico past the red tide to find a variety of fish, including large mangrove snapper and almaco jacks that can be found past 8 miles. Also, many large sharks — blacktips and bulls — are present offshore.